Every day 70-year-old Abu Ali Shami looks at Israel from his olive grove. The barbed wire, which is only a metre away, reminds him of what life was like when Israeli soldiers were stationed on the Lebanese side of the barbed wire fence. "We were powerless," Abu Ali Shami says. "There was so much injustice, if felt like we lived in a big prison." Like all residents of Kfar Kila, a village on the Lebanese-Israeli border, Abu Ali Shami still remembers restrictions on travel and the climate of fear, enforced not only by the Israeli military but also their Lebanese collaborators. "We were so happy when they left," remembers Abu Ali, another villager in Kfar Kila. "They withdrew in the middle of the night and it felt as if we finally had our country back." Ten years on since the withdrawal, the UN together with the Lebanese army patrol the border area. But flapping in the breeze along the fence are yellow and green flags of Hezbollah. Waving next to them is the flag of the group's biggest foreign backer - Iran. It is Hezbollah that has real control over what happens in southern Lebanon and many villagers say they like the arrangement. "It's the resistance, its weapons and [Hezbollah leader] Hassan Nasrallah who make us feel safe here," says Fawwaz Mohammed. "Without the resistance we could never be free." Hezbollah is staging a series of events marking the 10th anniversary of the Israeli withdrawal, and what it sees as its victories since then - particularly the most recent war with Israel in 2006. Among them is the opening of a new war museum just a short drive away from the border. The museum showcases hundreds of pieces of weaponry and equipment. The museum cost more than $3m to build. This was raised, according to Hezbollah, entirely from private donations. "It's a commemoration of our fighters, of our martyrdom and also this museum is the way of reminding the new generation about sacrifices that they made," says the group's spokesman, Dr Ibrahim Moussawi. As a guide leads visitors around the museum through an elaborate network of underground tunnels, he describes the battles and the living conditions of the Hezbollah fighters. Almost all of South Lebanon is riddled with similar bunkers, it is believed that Hezbollah uses them to keep its weapons and train its guerrillas. But the guide brushes off all questions about the real tunnels: "It's a secret," he laughs. While Hezbollah remains extremely secretive about its military, the museum is in many ways, a sign of just how much the group has evolved over the last 10 years. Today, it is arguably the most powerful militia in the Middle East and inside Lebanon it also functions as a sophisticated political organisation which has won elections, which has a track record of doing serious social work, and which is clever at marketing itself. Hezbollah's growing military might, fuelled by funding from Iran, is a serious concern for Israel and its allies. 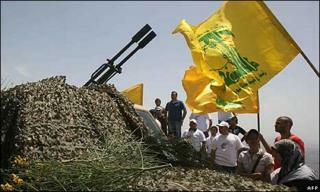 Israel and Washington have recently accused Syria of transferring long range scud rockets to Hezbollah. The allegations sparked off a new cycle of mutual accusations, and speculation about another war. The Lebanese Prime Minister, Saad Hariri, was among those to deny the allegations that there were scud rockets in Lebanon, but Hezbollah never issued a denial. In fact many in Lebanon believe that the group does have some sort of long-range missile, if only because in some of his recent speeches the group's leader, Hassan Nasrallah, has threatened to hit targets deep inside Israel. "I don't know what kind of rockets Hezbollah has, but what I do know is that Hassan Nasrallah does not make empty threats. Israel knows that, which is why they are worried," says Beirut-based analyst Rami Khoury. And yet, despite all the talk of war, tensions and mutual accusations - or partly because of it all - the situation, Rami Khoury believes, is currently under control. "What we have now is a situation of quite good mutual deterrence. Nobody is going to give up or surrender to the other side. At the same time, both sides know that if they start a war, it will be ferocious and it will kill many civilians," says Rami Khoury.